Absence Makes The What Grow? The more fresh fruit and vegetables we eat, the more fruit flies we have to contend with. They piggyback on grocery store fruit and multiply like crazy once they get to the house. In years past they were overwhelming. They’d not only swarm fruit sitting out on the kitchen counters, but also around the garbage can, compost containers, and sink. I found this little tip that works wonders for keeping them under control, and as I prepared this week’s batch, I thought I should share it with you. Simply take a small, shallow bowl (these Pyrex bowls work well, but ramekins work well, too) and pour in a half-inch or so of apple cider or red wine vinegar. Then take a drop – really, just a drop – of dishwashing liquid like Dawn in the vinegar. Place the bowl next to an area where you’ve noticed a lot of fruit flies. I’ll typically place mine next to the garbage can or close to a bowl of fruit. That’s it! As you can see by the picture above, this works great. 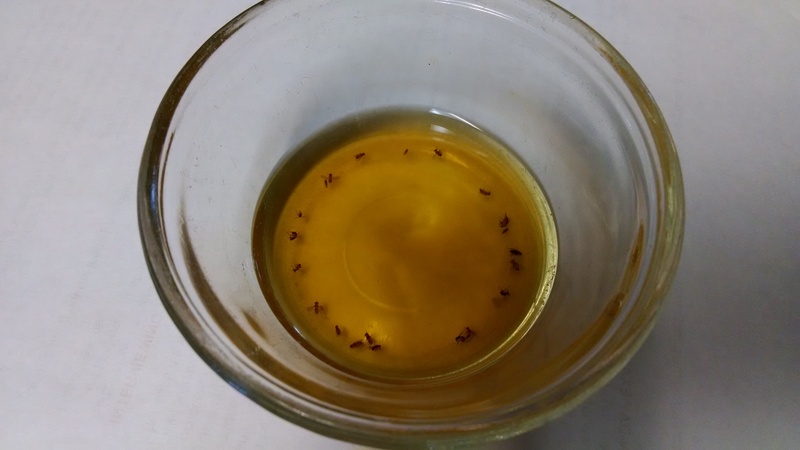 The mechanism, if you’re interested, is that the fruity vinegar attracts the flies and the dishwashing liquid breaks the surface tension of the vinegar so that rather than floating on top of the liquid, the fruit flies sink. They aren’t poisoned, they’re drowned. I hope this little tip helps you like it has me. If you have any tips like this, please share! Good timing! We are battling fruit flies at our house!